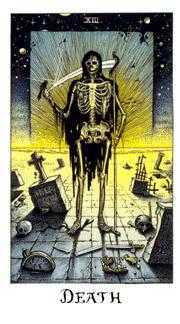 Shed the old to make room for the new. 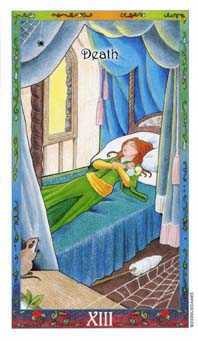 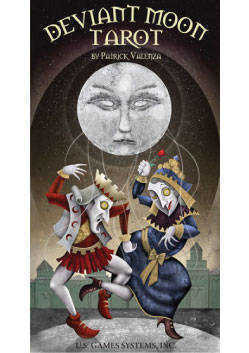 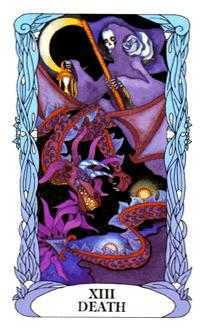 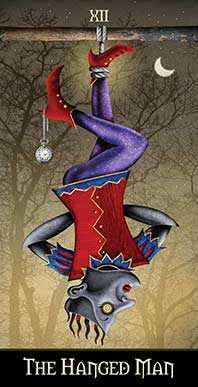 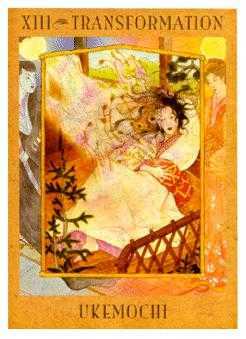 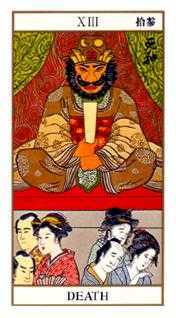 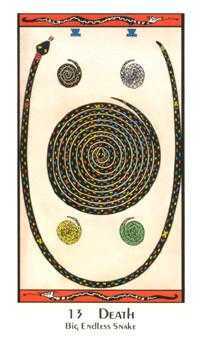 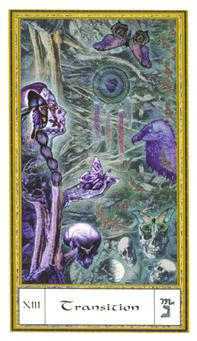 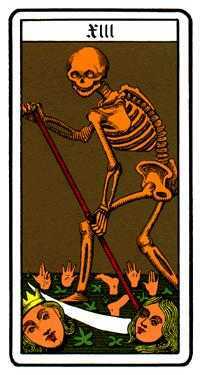 Deviant Moon deck © U.S. Games Systems, Inc. 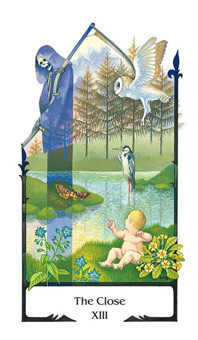 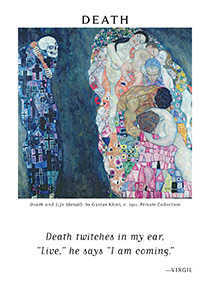 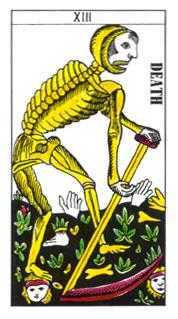 The Death card is not about the literal death of any person. 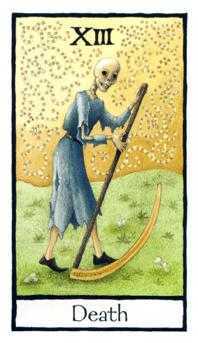 It may represent the death of something else, like a project, plan, or relationship. 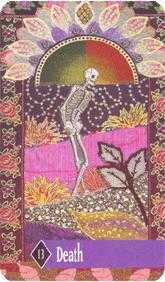 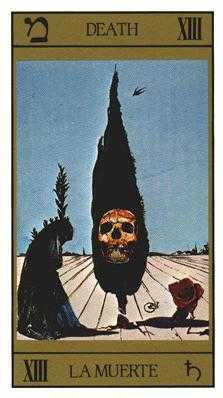 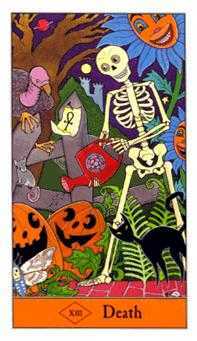 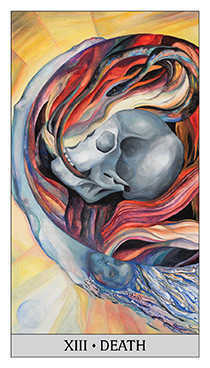 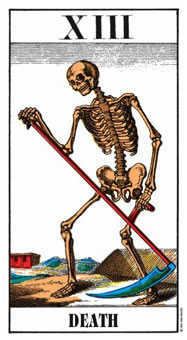 This card also points to a time of harvest, symbolized in classical decks by the reaping skeleton. 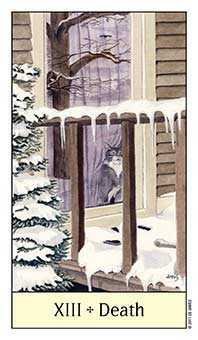 Unless the fruits of summer are harvested, they are lost to winter's harshness, and the people do not eat. 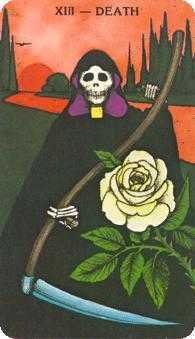 As the scythe cuts the cords that link us to the past, it liberates us to go forward without fear, because we have nothing left to lose. 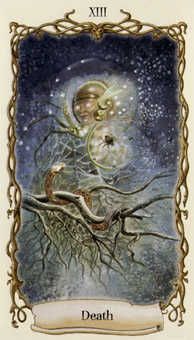 Everything being pruned away is recycled for the fertility of the future, so that nothing is really ever lost, despite seasonal cycles of gain and loss. 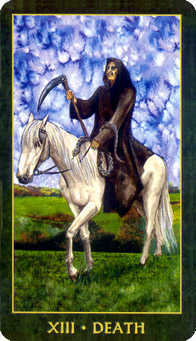 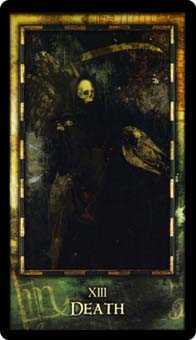 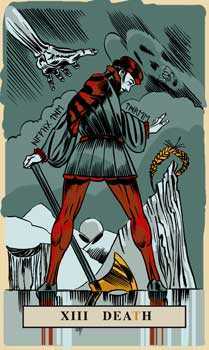 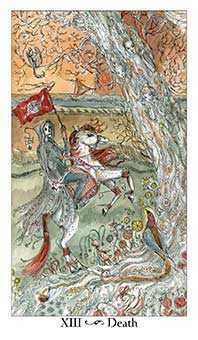 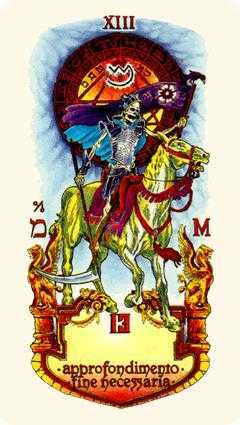 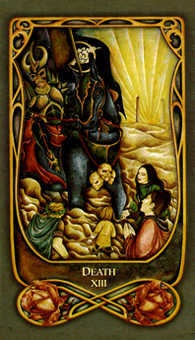 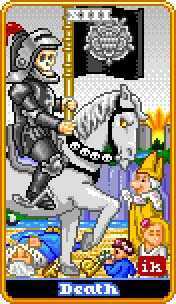 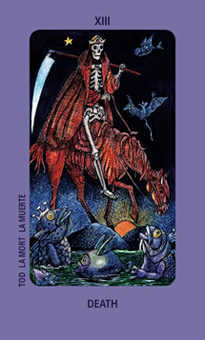 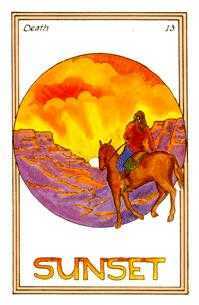 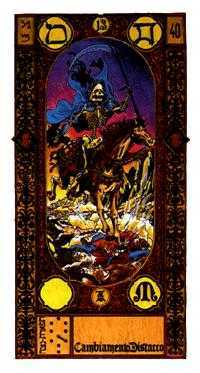 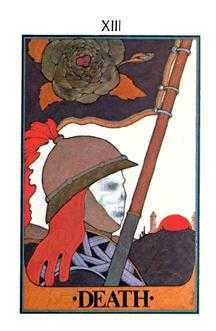 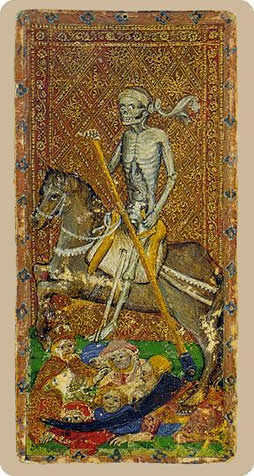 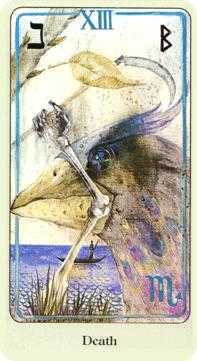 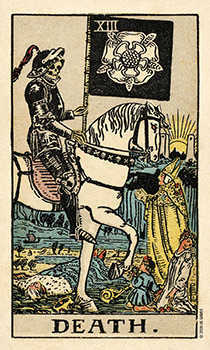 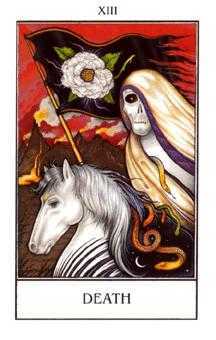 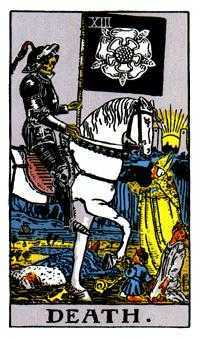 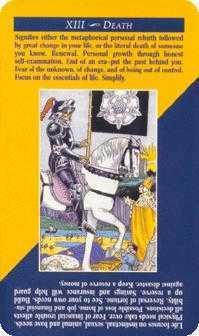 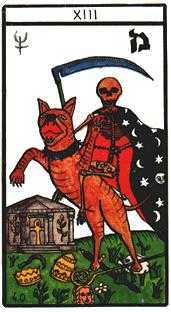 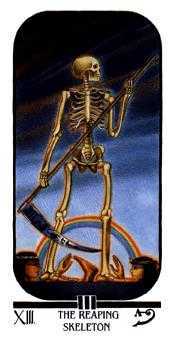 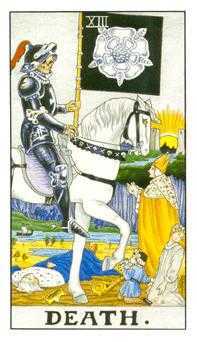 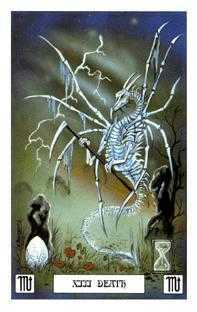 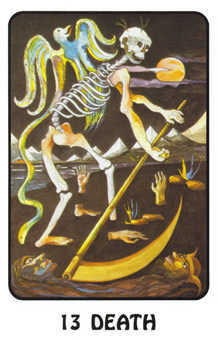 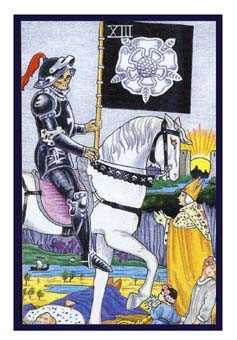 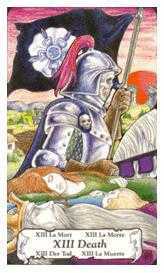 In more modern Tarot decks, we see Death mounted on a horse and wearing black armor. 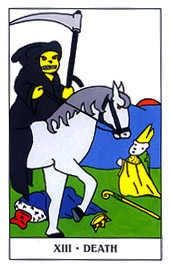 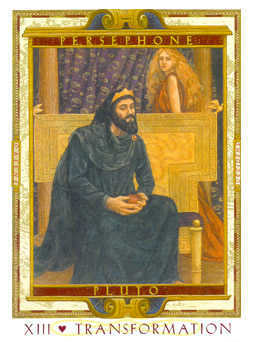 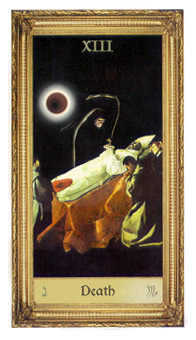 The emphasis in these decks is on the punishment of sin, as in the way the medieval Plagu (which the Death image was based on) was used to explain the wrath of God. 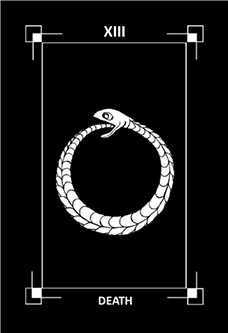 Luckily, in modern times, we are not so encumbered with such a guilt-ridden philosophy. 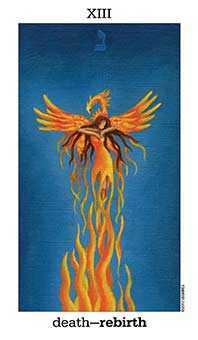 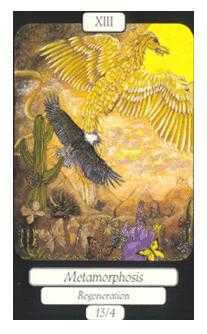 Free yourself from a past that no longer serves you well and proceed toward the future. 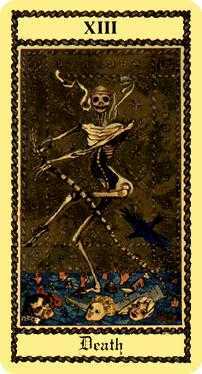 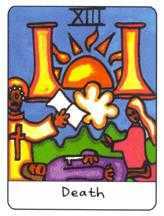 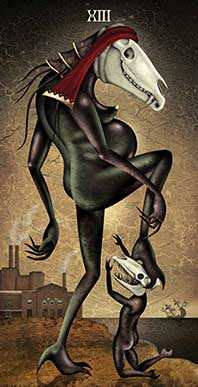 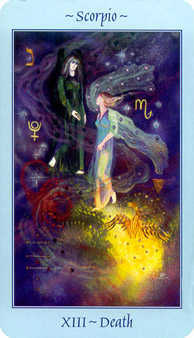 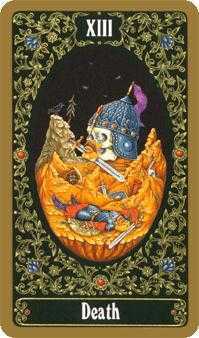 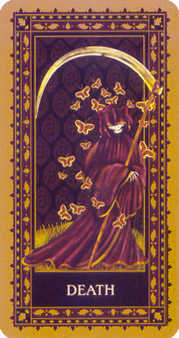 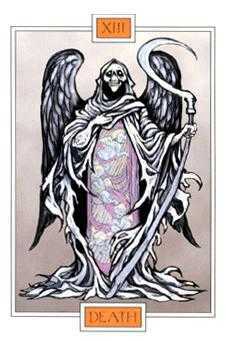 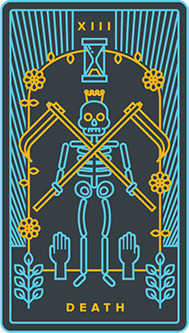 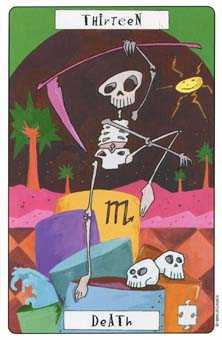 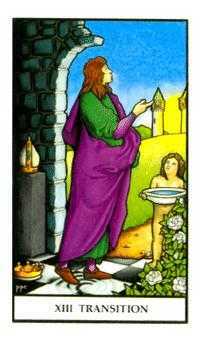 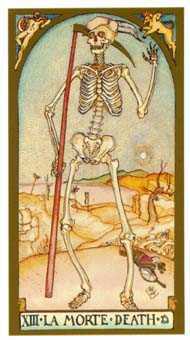 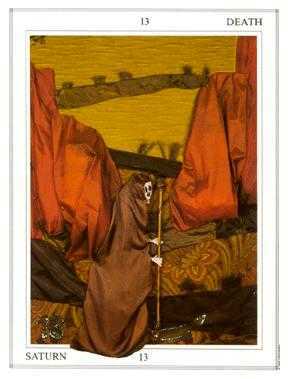 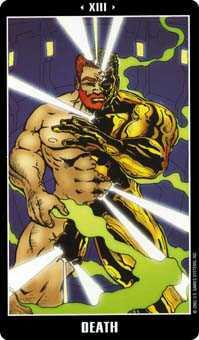 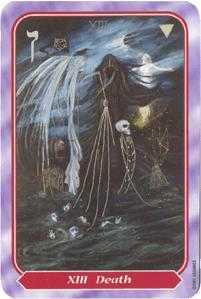 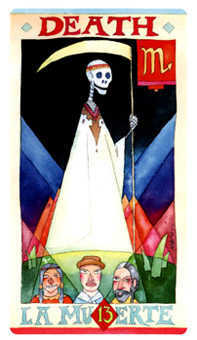 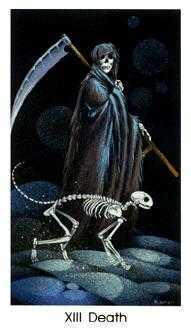 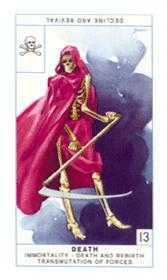 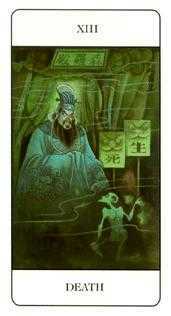 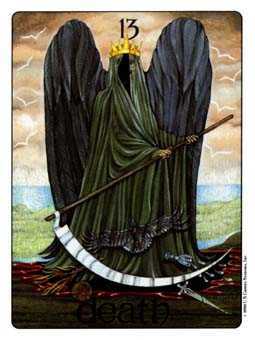 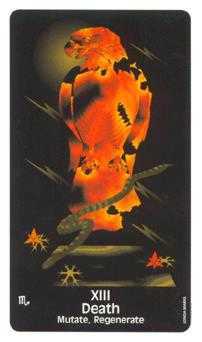 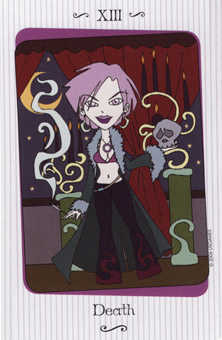 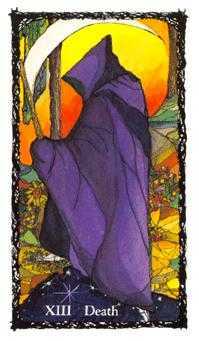 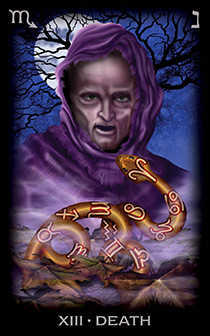 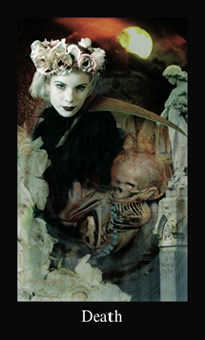 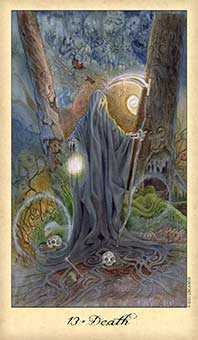 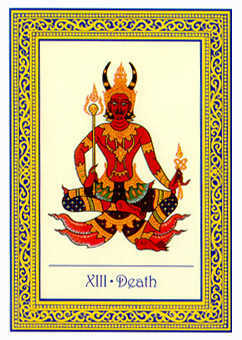 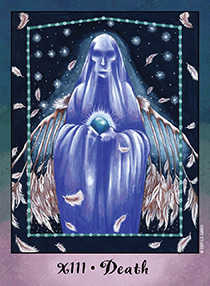 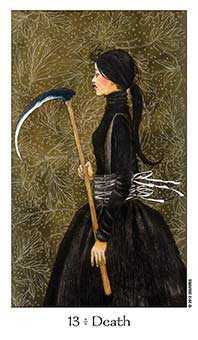 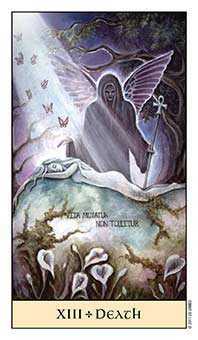 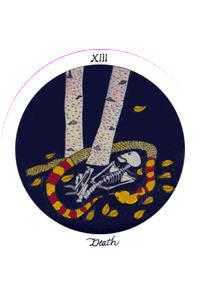 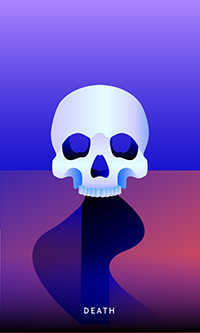 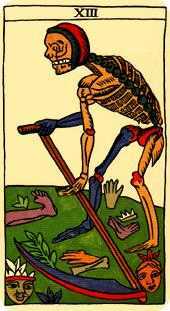 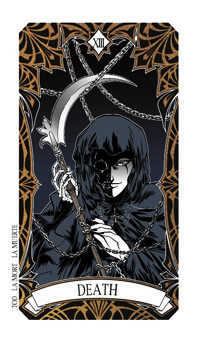 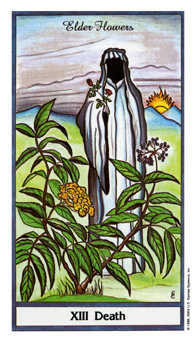 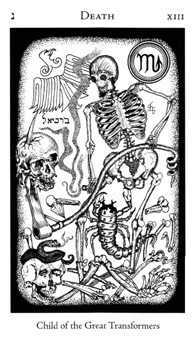 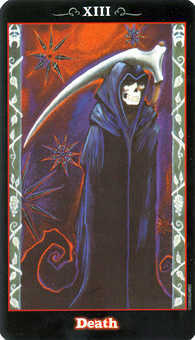 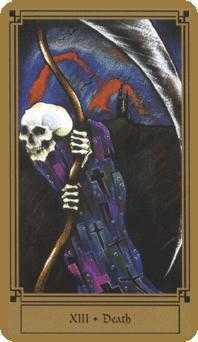 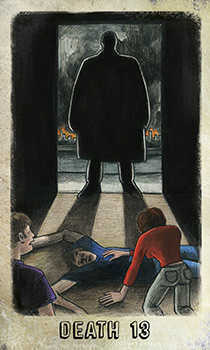 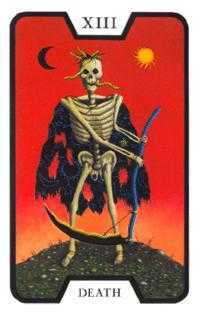 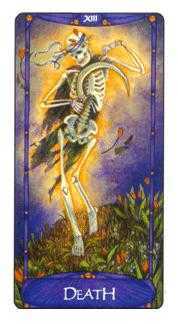 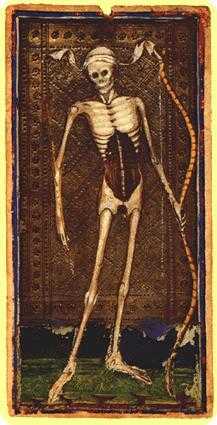 The Death card advises you to detach from the old order. 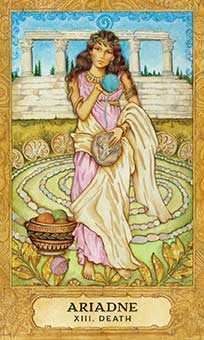 You may want to close accounts, complete unfinished tasks, and gather your harvest. 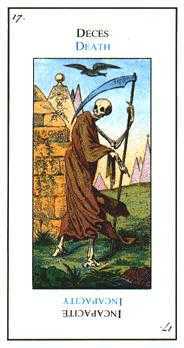 It is time to move on. 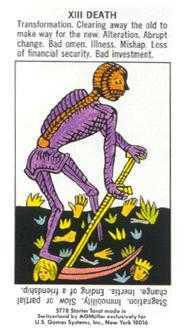 If you cut the cords that have bound you to old ways and outdated conventions, you could free yourself to join the sweep of incoming light. 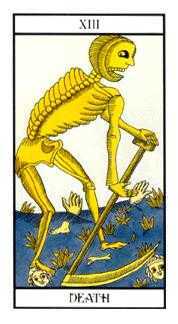 This is not an excuse to reject others or hurt them in any way. 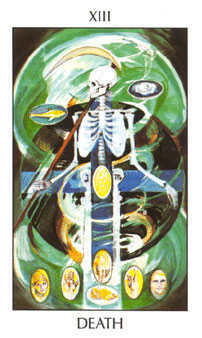 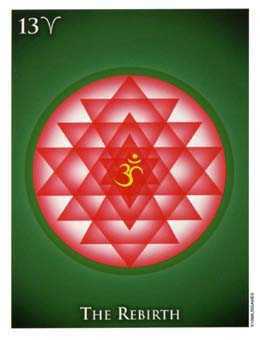 It is simply a time to move toward your ultimate interests. 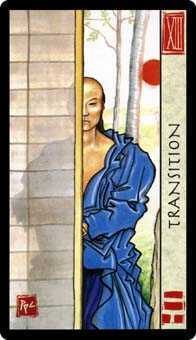 Do not allow nostalgia and outworn loyalties to hold you back. 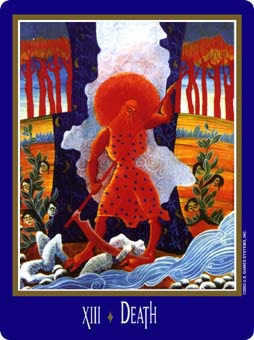 Be willing to go through whatever it takes to get to where you really want to be.